Every week, you spend hours creating powerful and original content. After all, once you learn how to start a blog, great content is the secret to blogging success, right? But you’re starting to wonder if the results really justify your time and effort. You get worryingly little traffic, few social shares and only a trickle of email subscribers. As a blogger, one of your biggest priorities is driving traffic and subscribers to your blog, but so far, you’ve failed to find a strategy that really delivers. You’ve tried buying Facebook Ads, “dominating” Twitter, creating visual content and pitching guest post ideas to high-traffic blogs. Unfortunately, in this saturated online space, it has become tough to stand out amongst the sea of blogs and drive traffic to your own. What if you could leverage a platform that gets more than 70 million visitors a month, won’t cost you a dime and lets you direct traffic back to your blog? “Sign me up!” you say? 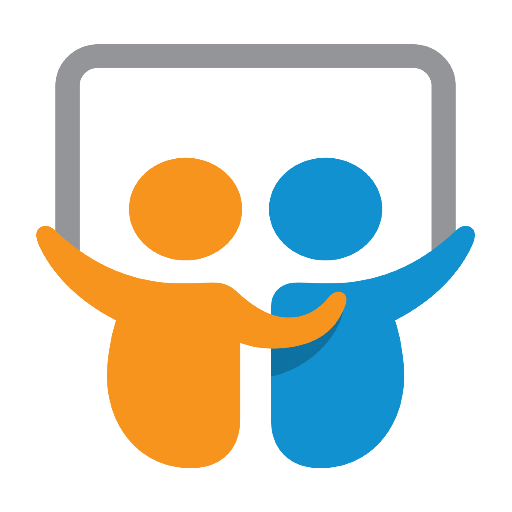 Enter SlideShare, a presentation-sharing platform owned by Linkedin. “But Michael Hyatt already has a huge following,” you protest. But what if I were to tell you that I started without a following and managed to garner over two million views across my SlideShare channel — resulting in over 400 new email subscribers per month. And it all came from a single SlideShare presentation. Recycling your best posts as SlideShares not only extends the life of your content, it also offers a new medium for presenting your ideas and acts as a magnet for potential new subscribers. And you can do it using tools you already have — like Microsoft PowerPoint or Apple Keynote, or online applications like Google Slides or Canva — uploading the completed slides to SlideShare. List posts (or “listicles”) tend to work best because they convert easily to a presentation format, e.g. X Tips for Y. Expert roundups also work great, and you can even create a roundup specifically for creating a presentation rather than a post — the format lends itself well to a series of insightful but pithy quotes. To begin, open up your favorite presentation application and create a new slide deck, choosing a suitable design template. The image below shows Google Slides — the free presentation tool in Google’s online suite of office applications which also includes Google Docs and Google Sheets — with the available design “themes” in the right menu. If you’ve written a strong headline for your blog post, it should make a good title for your SlideShare too, so you can copy it straight across. 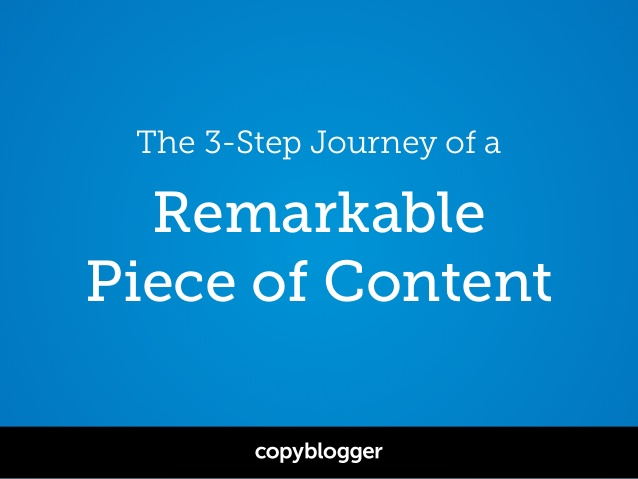 Copyblogger repurposed their hit post: The 3-Step Journey of a Remarkable Piece of Content into a SlideShare that roped them 30,000 views. If your headline is relatively short, you could make your presentation look and sound more tantalizing by using a subtitle. The main sections of your post translate to the main sections of your presentations. Often that means you can use your section subheadings as transition slides — i.e. slides that signal the start of a new section. Keep in mind, that if your list post is epic in scale — something like “101 Ways to Promote Your Latest Blog Post” — it’s better to extract only the best 10 points or so and expound on those. 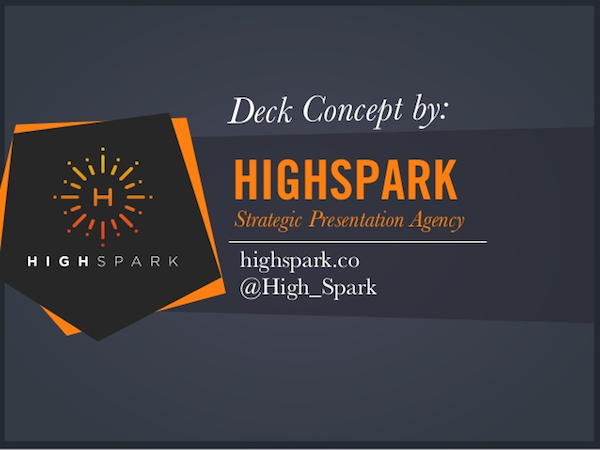 A SlideShare user may be intimidated to see a deck with over 100 slides. As a rule of thumb, around 30-50 slides should keep your readers engaged without feeling overwhelmed. For truly “monster” posts, you may be able to create multiple SlideShares, each focusing on a different aspect of the post. 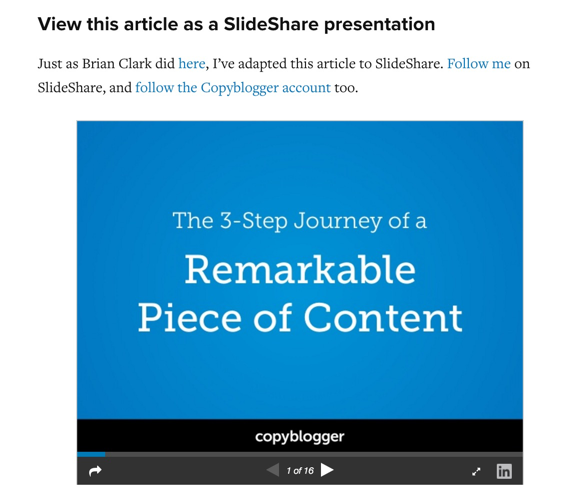 In Copyblogger’s case, a simple 16-slide SlideShare managed to get them 30,000 views. Once into the content itself, you should aim to capture your main points in just a few short sentences, with each slide containing a single point. Keep each point long enough to preserve its meaning, but brief enough that it doesn’t feel like a full-blown post was pasted into your slide deck. If you already write in short, punchy paragraphs, you may not need much adaptation, as in the Copyblogger example above. But a useful rule-of-thumb is to keep each point to about 10-14 words or about 140 characters, something that is brief enough to be tweeted. When in doubt, you can find successful SlideShares to model after here. Bonus Tip: Ensure that your content slides feature any relevant keywords you’d like to rank for in Google — SlideShare automatically creates a transcript based on your presentation’s content which is indexed by search engines. So you’ve spend an hour creating an awesome-looking deck based on one of your favorite blog posts. It looks great, the points are strong and you think the SlideShare audience will love it. Well, you want to make sure that some of the attention your shiny new deck receives gets channeled somewhere useful. After all, it’s no use being a hit on SlideShare if that doesn’t also translate into more traffic and subscribers for your blog. And if you don’t take deliberate steps to turn SlideShare “eyeballs” into blog visitors your deck will become just another lazy asset. Directing visitors to your blog means strategically embedding links in your slide deck. Note that due to a deliberate restriction within SlideShare, only links inserted after Slide 3 will appear in the final slide deck. This is to stop people from “link bombing” the first few pages of their presentation. You have to earn your reader’s attention with your first slides and only then do you get to direct it somewhere else. You may be surprised how often people find you via your profile information. Content is important, but sometimes people are more interested in who’s behind that content. This is particularly true for personality-led brands like Gary Vaynerchuk and Guy Kawasaki. If you give people the opportunity to get to know you and connect with you, some will reach out. Linking to your social profiles and main website will give viewers the opportunity to connect with you directly outside of SlideShare. Probably the most valuable place to direct visitors from your SlideShare presentation is to a landing page that captures their email address so you can grow your list. The best way is to offer a lead magnet (or “bribe to subscribe”) on your own blog — either using a custom page type in WordPress, a list-building plugin, or a hosted service like Instapages or LeadPages — incentivizing viewers to leave their details. 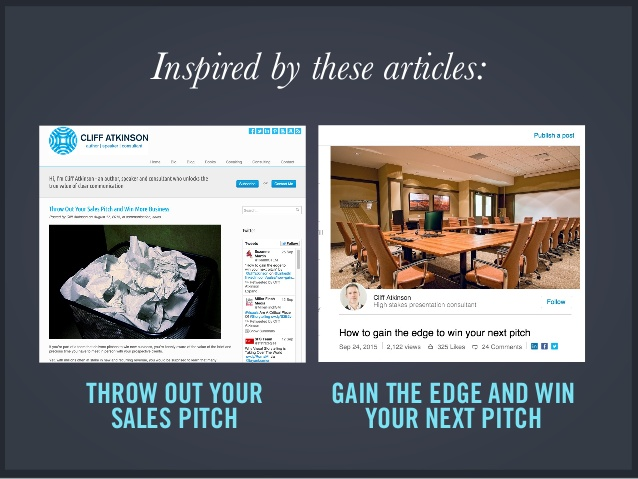 Once you have a landing page, then you can promote the lead magnet within your SlideShare. 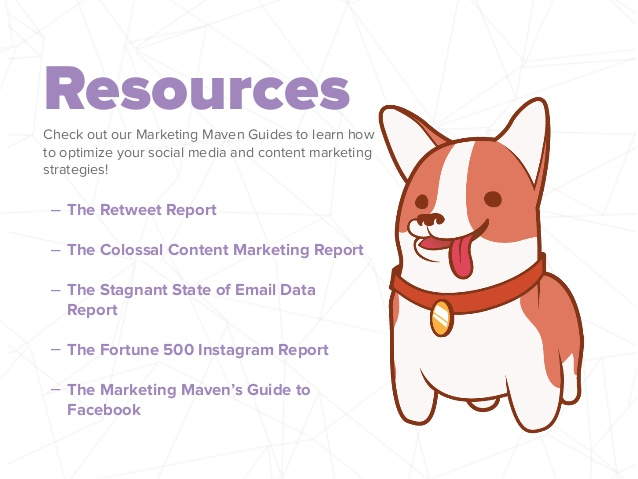 Click on any of the resources in the list and you’ll arrive at a custom landing page on the TrackMaven site, giving you access to the selected report in exchange for your contact details. But just remember, perfection is the enemy of progress. It’s important to get started rather than stress over the details. You can grab a free account with landing page software like Instapage or whip up a basic lead magnet and place it on a free Gumroad account. Don’t agonize over the lead magnet either. Consider using free psdcovers.com for ebooks, buy a template over at CreativeMarket or hire someone on Fiverr to make your basic design look more snazzy. To get some ideas, check out this post: The Quick and Dirty Guide to Creating Your “Bribe to Subscribe” in Record Time. You can only pack so many powerful words into a SlideShare presentation. Holding back information gives visitors an incentive to head to your site for the rest of the story you intentionally left out of your teaser on SlideShare. Try placing these links towards the back of your presentation to target people who fully consumed your content (and are hopefully eager for more.) This way, you’ll avoid backlinks to your blog competing for attention with other links in your presentation, e.g., those linking to your lead magnet. This slide, the penultimate one in a deck, links back to the two separate posts that inspired the presentation. Once the visitor lands on your blog, you have an extra opportunity to capture their email address via a more generic opt-in form. The general strategy is to have links with different purposes embedded at various points within your presentation to increase the chances of visitors taking some kind of valuable action. You want your SlideShare presentation to be shared as widely as possible on social media, so you should also embed links to encourage that behavior. Another tactic that works well is to link to a service that allows the reader to “pay” for some additional asset — for example, a downloadable PDF version of your presentation — via a social share. You can use a service like PayWithATweet to embed a simple call to action that allows the user to download the deck once they’ve sent their tweet — or shared it on another supported social network. Spreading it on Twitter, Facebook and Linkedin not only adds to the virality of the presentation but helps you get a spike in views, which may bring it to the attention of SlideShare editors who can choose to make your deck a featured presentation. Once your presentation is complete and you’ve embedded all the necessary links, it’s time to upload it. 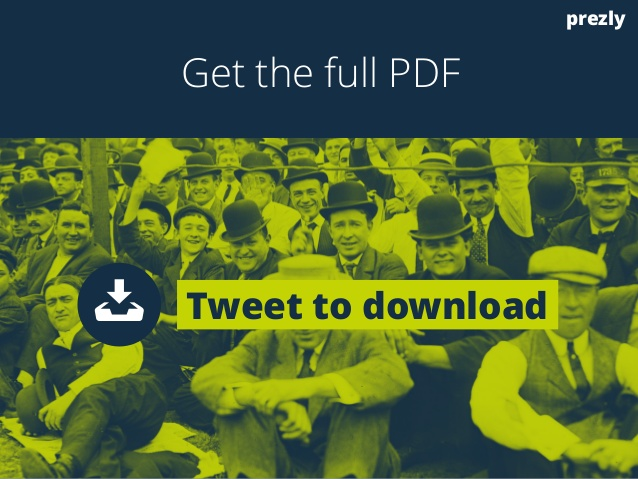 Note that SlideShare supports files uploaded as PowerPoint (.PPTX) format or PDF so you’ll need to save or export your presentation as one of those formats. Once uploaded, you can preview your presentation by stepping through the slides in the slide deck embedded in the top-left corner. Some fields are compulsory while some are optional, but you’ll get the best “Discoverability Score” (SlideShare’s measure of how easy your deck will be for other users to discover) by completing all the fields. Include your target keyword in the title. 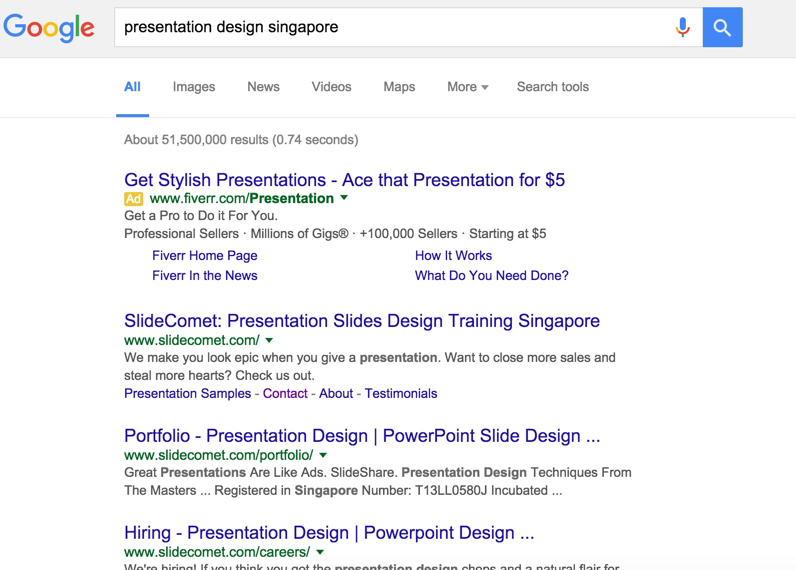 Your presentation’s title will be the one that appears in any search engine results. It will also be used to create the final SlideShare URL. So it’s important to ensure that the title includes any keywords you want to rank for, particularly as you can’t change the URL afterward. Build curiosity with your description. Your description will appear underneath your title on Google’s results page, so use it to create interest and curiosity for your presentation. The description also appears on your presentation’s page on the SlideShare site. Add tags to target specific interests. Tags help your presentation get discovered by other SlideShare users searching for specific popular terms. To tap into SlideShare’s huge audience, be sure to include 10-12 tags related to your slide deck’s topic and related industry. For example, if you’re writing about digital marketing, that should be one of your tags. Uploading your presentation and giving it the right metadata is only half the battle. “Content creators should spend 2x the effort in promoting their content as they did creating it.” — Ross Simmonds. Although SlideShare’s organic traffic is impressive, to get the most out of the SlideShares you create, you’ll need to drive visitors to them via conventional promotion. 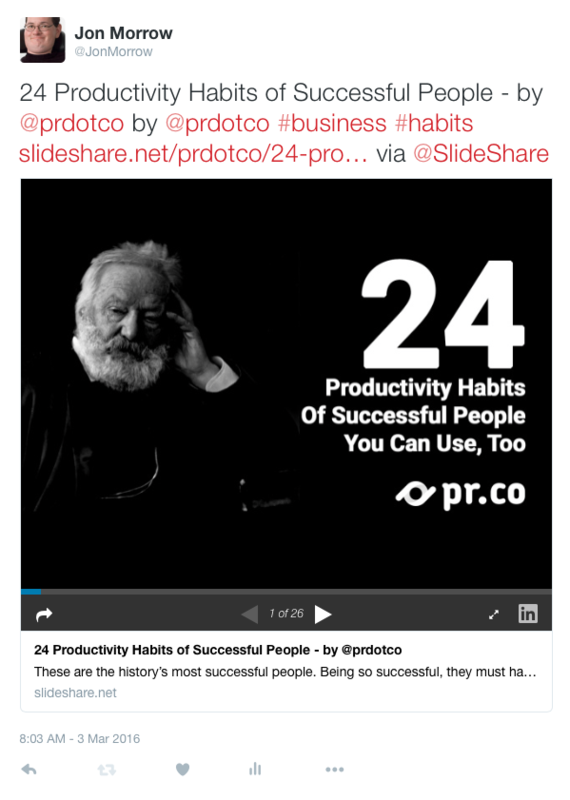 The most obvious place to embed your SlideShare presentation is within the post that originally inspired it. An embedded presentation makes an apt visual accompaniment for your post and also generates more views for your SlideShare overall. You can also add links to let readers share your presentation directly. 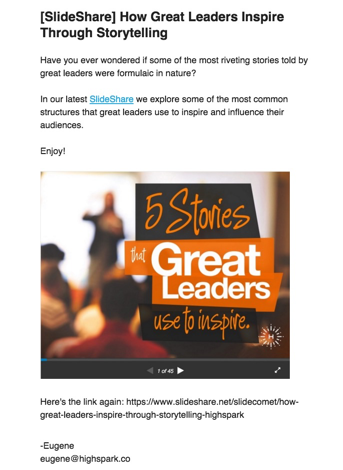 By clicking the ‘Share’ button on the main page of your SlideShare, you can grab embeddable links in the form of an iframe link or a shortcode, which you can then copy and paste into your blog editor. Emailing your list whenever you have a SlideShare to share is one of the easiest ways to give your decks a spike in traffic. If your audience has already read the post from which you based your SlideShare, you can tweak parts of the content to differentiate it. For instance, you could take advantage of SlideShare’s visual medium by changing the headline and including additional examples not featured in your original post. However, you could also take the view that since you repackaged your ideas as a SlideShare, it’s almost like a new piece of content. Some people will prefer reading your content in this format. Just don’t try to pass off identical content as something new. Here’s an example of how to “signpost” the fact that your content is now in SlideShare format in the subject line of your email broadcast. This lets you piggy-back on the site’s traffic even more by effectively including links to your content within the post — not just one text backlink in your author bio. In this capacity, SlideShare becomes a “gateway” of sorts, leading visitors back to your main content hub. The great thing about sharing your SlideShares on Twitter is that users can watch them right there in the feed, without leaving Twitter. They just need to click the “View media” link that appears. As a result, readers get a clickable, visual piece of content to interact with without leaving the platform they are on, resulting in significantly more engagement and conversion. So don’t rely on other people to share your SlideShares — include them in your social media schedule and repost each one several times to give your followers the best chance to see it. To increase the chances of your presentation being noticed, you can add an image – e.g., the title slide of your deck – using Twitter’s “Media” button. Most people only use it for correcting mistakes they spot after the initial upload. But as your blog grows, this feature is also handy if you update any of your posts or change your site’s branding. 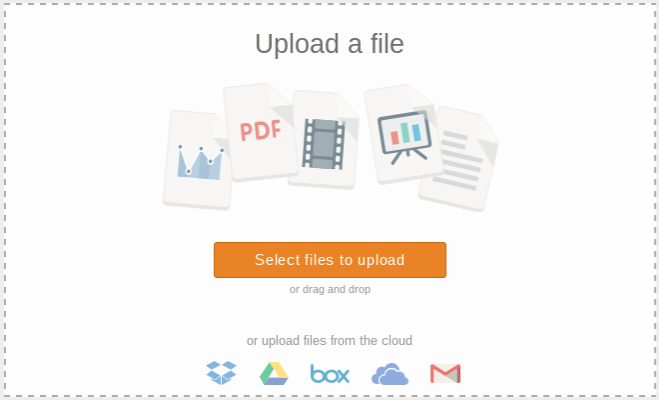 You needn’t be concerned that your SlideShares could hamper your new direction — the re-uploading function lets you update your presentations whenever you like. But there’s a more strategic way to use this feature. You can use it to change the call to action links in your slide deck. 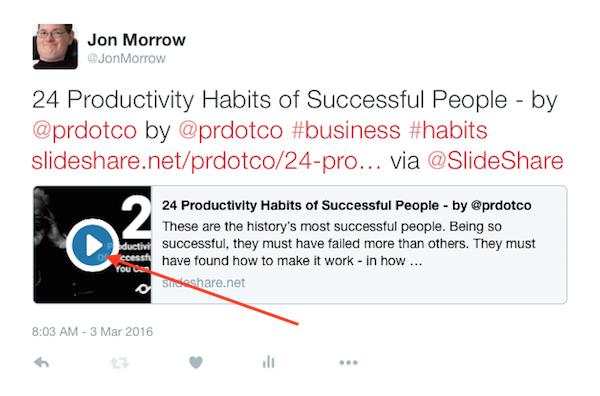 Remember that guest post that you snagged where you embedded one of your SlideShares? You can update this presentation to include links to your latest traffic magnet simply by uploading a new version of the presentation. That way you’ll always have that platform working hard to make money for your blog or drive subscribers for you. Here’s the specific strategy I use. On the first upload, I always ensure that the most prominent link is a PayWithATweet link, gaining more shares in exchange for a free download. The initial spike in traffic should help the deck get noticed by editorial staff and other viewers on SlideShare. As soon as I start getting traction — or if the presentation reaches the SlideShare front page — I’ll re-upload my presentation, this time changing the link to the landing page which offers the lead magnet. With this strategy, I can use the initial interest in my presentation to raise its profile on the SlideShare site and then, capitalize on the extra exposure to funnel traffic back to my lead magnet. This results in more traffic and subscribers than I would have received without the “viral enabler” element. The re-uploading feature means they can use this popular presentation to drive different messages whenever they like just by changing the call to action links. If you’re sick of seeing meager results from your content efforts, take a good look at SlideShare. It’s an exceptional platform for traffic-hungry bloggers, and it’s flexible enough to work in tandem with your current efforts. And believe me, the results can be impressive. 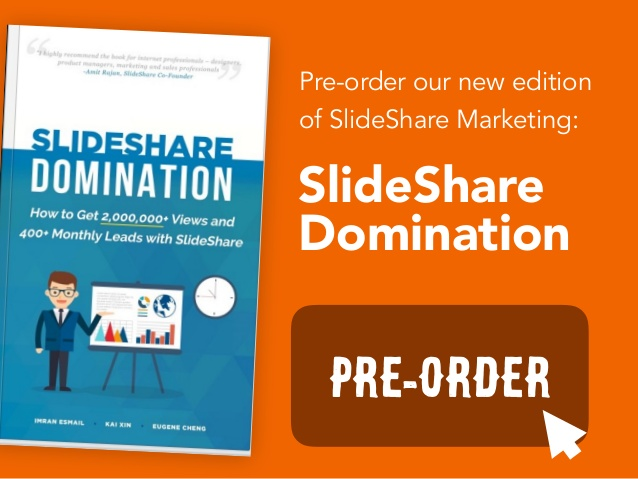 SlideShare has helped me build an email list of more than 10,000 subscribers from nothing, enticing potential affiliates rank highly on Google for relevant terms and drive tons of traffic to my site. If you follow the steps above, you’ll be well on your way to your own SlideShare success. 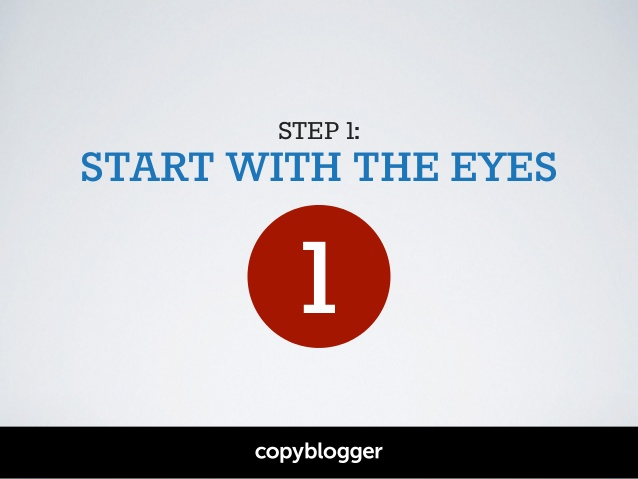 Just begin with the content, tools and contacts you already have. Then scale your efforts as you see results. Why not jump into your blog’s archive right now and find a post that will benefit from the SlideShare treatment? The sooner you get started, the sooner it’ll take off. About the Author: Eugene Cheng is the co-founder and creative lead of HighSpark (formerly Slide Comet, a strategic presentation consultancy serving Fortune 500 companies like: Panasonic, Dentsu, Nike. A self-confessed presentation obsessive, he relishes in building compelling visual content for his agency’s channel and his personal channel on SlideShare and is also a Keynote Author (top 1% of SlideShare). Thanks Michael! Glad you enjoyed it! Welcome to BBT! Thanks for sharing your great thoughts on SlideShare with all of us. I dabbled in SlideShare a little over a year ago (thanks to a recommendation from Ana Hoffman). Honestly, I don’t know why I haven’t done more of it. The three slideshares I created were very successful — two of the three were even featured on SlideShare’s homepage! As a result, I received very nice spikes in traffic. Thanks for the welcome! Don’t be too hard on yourself man. It’s a powerful platform no doubt, but it’s not always that easy to find the time to be consistent on it. I hope this has given you some ideas or at least… the impetus to try it again! Nice post, thanks so much for this, Eugene. 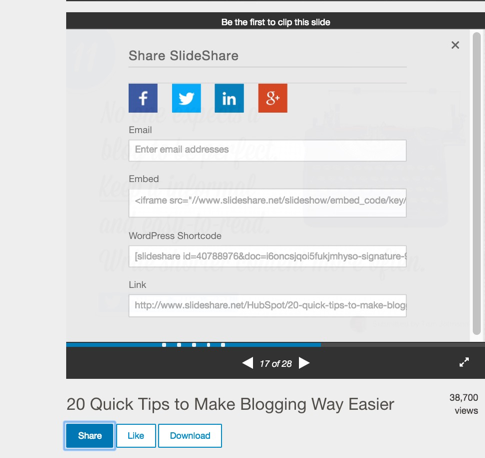 I’ve been hearing a lot more about Slideshare lately – it’s been on my list of things to do. 😉 Now I’ll bump it up higher. Great. Give it more than one shot, some time and I’m sure you’ll start to see some results. This post speaks to me because I know and understand how important this is. I’ve tried slideshare before and failed at it then gave it up. But in the last few months I’ve given it another chance because I know how untapped of a traffic source it really is. I’m definitely going to give it another go and really push for it. And like what you and Michael and so many others have experienced, it takes time. I can’t tell you the number of times that I posted something and prematurely told myself it wouldn’t fly ( okay actually I can count ) and have those end up on the front page. I think the key distinction is to leverage on other existing marketing avenues you have like your email list or social presences to drive traffic to SlideShare. It’s like a machine where you put traffic in and you get even more traffic from search and related backlinks. Thanks for the timely post Eugene! Like the others, slideshares have been on my list for a while as a way to repurpose some content. I published one a while ago, but with limited results. Good luck with your virtual summit! I’m in the middle of mine now and I know how much work they are. Great to hear that you’ll be giving it another shot. I think another thing to consider is to ensure that the SlideShare you put up is not a ‘me-too’ piece of content. Search up a couple of SlideShares on the topic you’re writing about. Take it all in and avoid doing something that harps on the same stuff. Invest time to make it great – with a good cover slide and a well-timed upload. Give it some time and I’m confident you’ll start seeing some results. Agreed, the summit is plenty of work, but putting all these experts on SlideShare together will be so worth it! Be sure to check it out if you can. Thanks, Eugene! What a wonderful way to ‘refresh’ evergreen content – and expand its exposure to new audiences. I really appreciate your steps, which take out the mystery and guide us towards Slideshare mastery! The dread I usually feel at the thought of tackling another marketing arena has been changed into excitement to rise to the challenge of Slideshare. Yeah! Don’t shy away from it, I think you just need to get started and things will start moving along just fine. English is my second language, I have problem of translating word to word from my mother language to English when i write. This makes me feel, i have bad writing and people ignore my post. Glad you voiced out. But you’re slightly offtrack here. I don’t think anybody will answer your question because this isn’t the relevant post. And I don’t think BBT is meant for that. If you’ll shoot me an email at adekunleabraham3 [at] gmail [dot] com, I’ll be pleased to tell you how I improved over time. It’s not hard as you think. Plus, you’re already capable of writing correct sentences. Some Indian guys can’t even string words together in English. Thanks for adorable article , Eugene sir, keep it up , I have a blog in hindi language . Please sir tell me how to increase traffic my blog. Thank you Eugene for showing how powerful Slideshare can be in your insightful post. I had already seen other writers use Slideshare beautifully and now you have given me some ideas regarding how I can make Slideshare do some heavy lifting for my blog too. I appreciate the adaptation for twitter you included as this will surely be a great way to get a few shares! Awesome sauce. Great to hear that Lita! It’s all about creating stunning visuals with your slides. SlideShare is undoubtedly the #1 traffic source if used right. Although getting into their front page with your slides might be hard but not impossible. So glad you covered so many practical tips to follow. Will be using them. Loved this article. I am a total newbie to this, but excited to begin learning more about SlideShare and using it to increase traffic. Thank you. Thanks for sharing all of this super valuable information! Never even heard of Slide share before this and plan to use it once I’ve developed my first PDF / E-book to give away with e-mail sign ups! Keep up the good, hard work. This is awesome! I know that Slideshare is one of the amazing platforms that anyone can use and have great chunk of traffic. Slideshare in itself is a very resourceful website with all the powerpoint stuff on it. I am thinking from sometime to hop on it, create an account and just have one slide with awesome content on it and check for myself as how it goes but thanks for sharing in-depth article on its potential and how to’s. During a break at work I decided to give your post a try. Man, was I wrong! I have added this to my calendar to make sure I convert a recent blog post into a slideshare presentation. I think not everyone will get crazy traffic from the get-go, but it can happen as you post more consistently. It’s all about the process! Thanks for giving it a read man. Eugene, this is HUGE. I have never thought about this, but it makes a lot of sense. It doesn’t take ages to do and I can clearly get some pretty serious traffic with a well thought presentation. Thanks for the great tips. I’ve heard a lot of this advice about slideshare… I always ignored it because it looked like hard work. But, now… I will try it. Anyway, thanks for breaking it down for us and explaining it well – it really helps and makes it even easier. I really appreciate it! I have been waiting for an article like this for a while. I think the most valuable part of your post is the tip to get initial traction with pay with a tweet. We’re only scratching the surface here Peter, lest the post gets too long… If you’d like to learn more, sign up for our free virtual summit to learn from other experts. I’ve never truly been into SlideShare but your post certainly changed my mind (go you with all the relevant examples on Micheal Hyatt and CopyBlogger!). As a blogger, I relate very much to what you said in the introduction about traffic being a pain point. I actually have a pretty massive experts roundup called “108 Experts Give Blogging Tips to Beginners” that can turn into a nice presentation. My question is what kind of results can those having a small following (like myself) expect from this strategy — since most of the promotion methods you mentioned like sharing with your email list, on your blog, on Twitter require you already established an audience? I think you’ve already started on the right track by reaching out to 108 different experts! When you don’t have a large following yet, you’ll have to piggyback on someone elses to get your results quick. 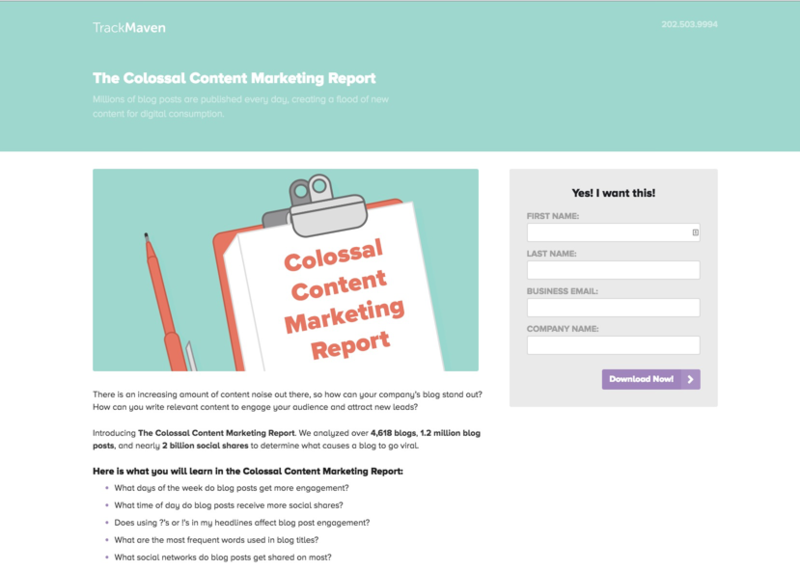 Using tools like ContentMarketer.io lets you do that. What’s more, if you convert your piece into a SlideShare, it can potentially drive more traffic to your blog as well. I made my one and only SlideShare presentation over five years ago. It’s time to brush off my log-in information and get back at it. Thanks for educating and inspiring! I did not use slideshare before. After reading your post I have got some awesome ideas. Great tips for not only using SlideShare to boost blog traffic, but helpful advice for what to do after uploading it. It can be overwhelming and intimidating to try something new; however, SlideShare seems like a unique way to gain some traffic without too much extra work. This piece does a great job of putting SlideShare into perspective- it seems like anyone can do it, especially with a basic knowledge of power point to get started. 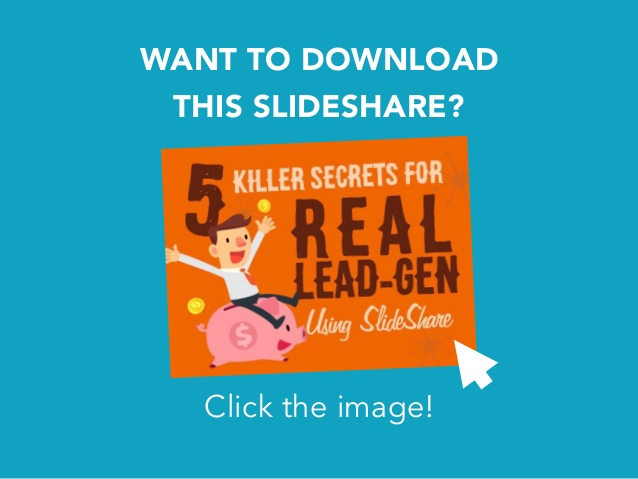 Immensely useful post about using SlideShare as a way to generate blog traffic & lure the visitors with a lead magnet. I’ll surely be suing the steps for my own blog. I really liked this tutorial on slideshare and how to get the most out of it! I like to diversify the content I put out and this is one way to do so. I didn’t know that Google had a feature that does slides like this. I’ll have to look into this. Besides that I can use keynote or use pages to turn my slides into pdf to upload. Thanks for all the details Eugene! Have a great weekend! You’re most welcome! It might be slightly challenging on different software like Google Slides, if you can do try to stick to the standard PowerPoint or Keynote! Great information. I have read about making presentations with Slideshare but you explained it so thoroughly. Going to make my first one right away. Thanks for sharing. Wow! i never think about it. Actually i am reading your blog from long time and today i read this guide and looks like something special mostly people don’t know this use of Slideshare i think they must need to read this guide for marketing. This is really fantastic and helpful guide. Great Article Eugene. Its really very informative and full of useful information. I actually didn’t realize that slideshows can help drive more traffic. I will sure try this out. Thank you Eugene for this great post! I landed on this blog while searching for ways to boost blog traffic. I really enjoyed reading your practical tips which take out the guesswork and helps us to master this document sharing platform. Who would’ve thought that slide shows can be as powerful as video ads and blogging? I always thought that these presentations are only done in an office meeting. Well, it’s a great thing to have read your article. This way you’ll not only work it offline but online too! SlideShare can really bring good traffic (and more than this) ‐ for free. 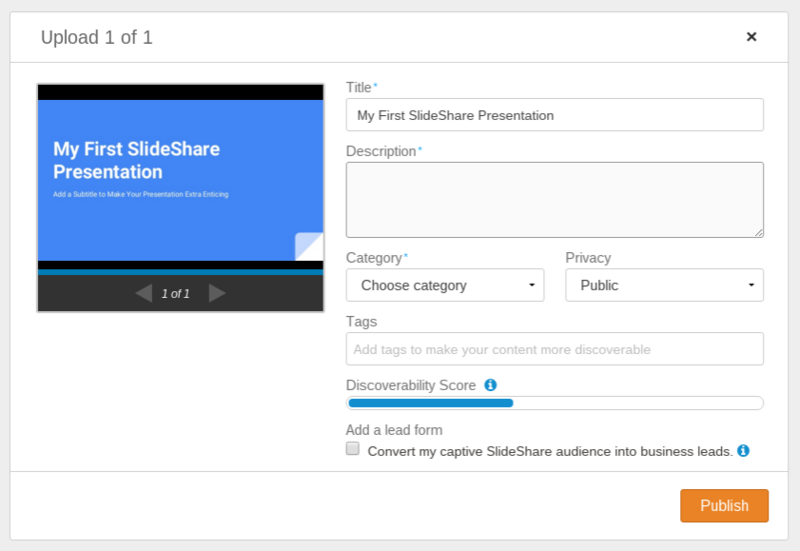 On SlideShare you can upload your presentation and if it gets popular, it can be viewed by millions of people. If you know how to make the presentation, you can not only get traffic to your site, but you can also improve your rankings with Google, expand your followship on sites such as Twitter, Facebook, LinkedIn, Pinterest, etc., attract more subscribers to your newsletter, or boost your brand/reputation online. I heard a lot about ShildeShare, but didn’t try it. What’s your favourity free tool? I’ll try Google Slides. This slideshare thing sounds really interesting to me i’m gonna try it now and see, thank you! Hey Eugene, This is one great traffic secret you just unveiled. I never knew slideshare could be an untapped source for target traffic and subscribes. Thanks for sharing this tutorial. I would surely make this a regular practice. Excellent post about how to get traffic and Subscribers from SlideShare. It is useful for new blogger and experienced too. Thanks to share such topic. Keep it up !!! Good article. I am very happy to reading your article with screenshots so that users can easy to understand the entire info. I knew about how to get traffic by using slideshare. Its really helpful to me. Thanks for sharing. Waiting for more article from you. Thanks for adorable article Eugene! It is very informative and very impressive. I never use SlideShare to drive traffic to my website. I read your post and found some interesting ways to drive huge traffic. I will definitely try SlideShare to boost my website traffic.